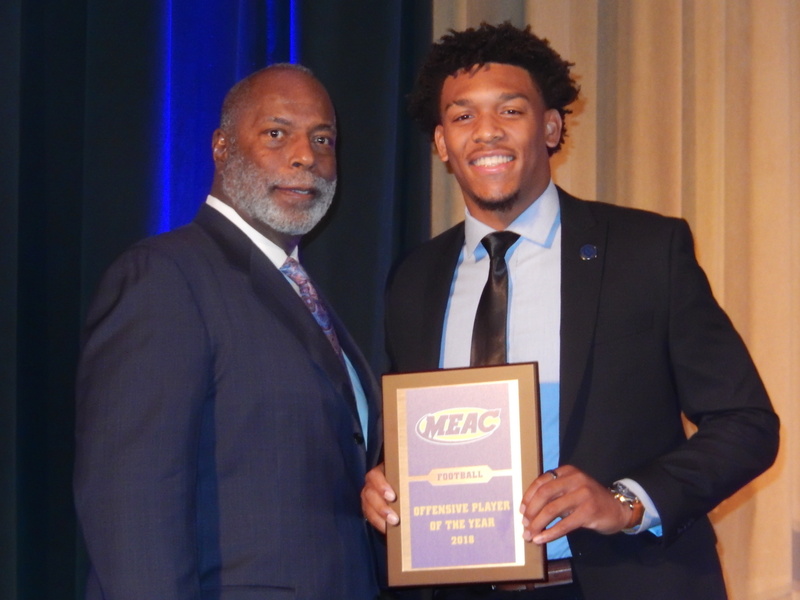 MEAC Commissioner Dr. Dennis E. Thomas left acknowledges Howard sophomore Caylin Newton right as the 2018 MEAC Offensive Player of the year. 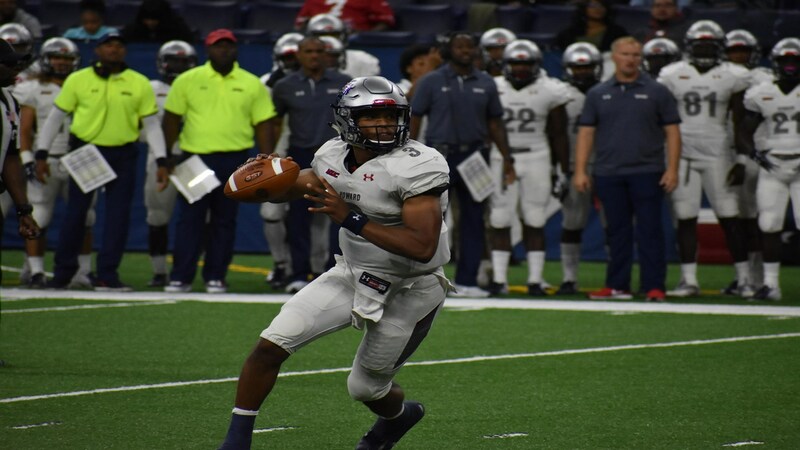 NEW YORK (December 4, 2018) – The Mid-Eastern Athletic Conference (MEAC) announced Howard quarterback Caylin Newton as offensive player of the year. It was made officially at the 61st annual College Football Hall of Fame press conference Tuesday morning in NYC. After winning the 2017 MEAC Rookie of the Year award, Newton ended his sophomore campaign ranking among the nation’s leaders in several categories. That includes passing yards per completion (1st/16.85) and total offense (7th/313.3). Newton completed his second season as the MEAC’s top passer with 2,629 yards and 22 touchdowns in 10 games. In the season opener against Ohio (Sept. 1), he posted 532 total yards. Additionally, the Atlanta native was named to the 2018 Walter Payton Award Watch List after winning MEAC Offensive Player of the Week twice. Currently, he is a finalist for the Black College Football Player of the Year Award. The Atlanta native is Howard’s first MEAC Offensive POY since Greg McGhee won in 2013 and 2014. He is the first sophomore to garner the award since former NCAT and Chicago Bear tailback Tarik Cohen.